Claude Niek at CSO Yachts gives me the go ahead to broadcast news of a price reduction on his central listing, the 26.2m motor yacht Minou. 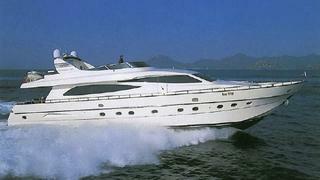 Built by Canados in 2003, she accommodates up to 10 guests in a master, VIP and two twin cabins. A major refit in 2008 saw Minou re-engined with twin 1550hp MAN engines which still have four years warranty on them. The price is now down from €1.95 million to €1.8 million.